I got cherries as my town fruit. Great! I would have liked to have placed it a little further south, but there was a tree in the way, which is exactly where I wanted to put it. Oh well, I'm pretty happy with it's placing. 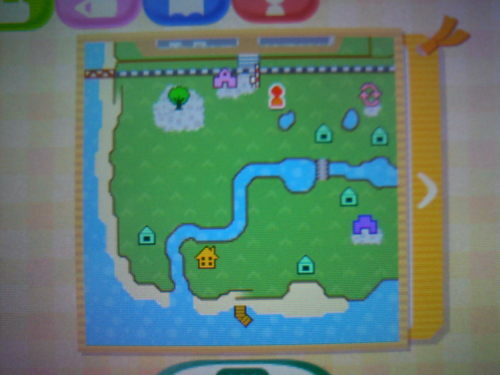 After I had placed my house, I went back to Isabelle, who told me it was time to officially welcome me as mayor, and told me to head over to the town centre, so that's where I headed. Isabelle had me plant the town tree, which would grow along with the town, and Skyfall was officially born! As soon as I had finished the initiation ceremony, I got a notification to tell me the Bug-Off was going on. But before I started the Bug-Off I wanted to check what was in Main Street, and grab a few bells before I set foot across the tracks. I shook a few trees to get some bells, until a beehive fell out, luckily I managed to flee into Re-Tail and escape the bee stings. However a few trees later I came across another beehive and couldn't get away in time... Darn. I went back to collect the beehives which I sold to Re-Tail for 500 bells each, just enough to buy both tools in stock at Nookling Junction. I headed across the track to see that the Nooklings had a shovel and net in stock. I bought the shovel in the shop - I was tempted to buy a net as well, but for some reason, I've always wanted to buy either a net or a fishing rod off Nat or Chip, so I waited until I got back to town to buy a net ,LOL. Instead, I spent 2 play coins on a fortune cookie. After leaving Nooking Junction I headed over to the Post Office to pick up the Rainbow Screen DLC. gave me, and a case of drawers I bought for a mere 500 bells at Re-Tail. I started doing a few more homey jobs around town, to try get Skyfall feel more like home. I started off by going back to the fruit tree with the perfect cherry, which I shook off and planted near Re-Tail, hopefully it'll grow! I then gathered a few shells along the beach to gain some extra bells (I also found three giant clams on my beach... aren't they meant to be rare? ), and I found the money rock, which gave me a good 10,000 bells which I gave to Nook as down payment on my tent - I should have a house tomorrow! With my left over cash I decided to hit up Main Street once again and try make my outfit a little more appealing. The Able Sisters didn't have many great items in stock, but I managed to chose a pair of glasses, and a nice training jacket. Asides from moving into town, nothing interesting happened. I did however win the Bug-Off, which I was rewarded with a nice gold trophy (which I won with a 111 point Raja Royal Brooke Butterfly, knocking out Rodeo's 89 pointer Agrias Butterfly), and a small butterfly table which Nat gave me for beating my own record. That's about all for today. It's taken me about an hour to write up this blog post, but that's only because I took a whopping 239 photos today alone! Hopefully I can control my self in the coming days so my posts are a little easier, and hopefully they'll be a little more intersting. I'm gonna spend the night hunting for a Tarantla, I want to catch the pesky fellow early on in the game. I've had no luck so far. I'll let you know tomorrow if I am successful. And now I shall sign off for tonight, and leave you with a few more pics below. got upset because the praying mantis he tried to catch flew away. jacket was pretty neat though! If you're interested in seeing all the photos I took today, you can do so in my Photobucket album, just click here. Hopefully you enjoyed my first blog post as much as I enjoyed writing it, and I'll see you tomorrow. Want to be friends on City Folk? Great to see another Australian playing Animal Crossing! Alas, I have one question. On the island, when you've placed your items in the basket sort of thing, how do you get them back? I've waited, but still can't seem to get them.